This video shows you an overview of how the Game Library system works in Tabletop.Events. You can run a game library at your convention using an existing library, or create your own library. Log in, and click on Conventions > My Conventions. Under the Special section on the right-hand side of the screen, click on Game Libraries. 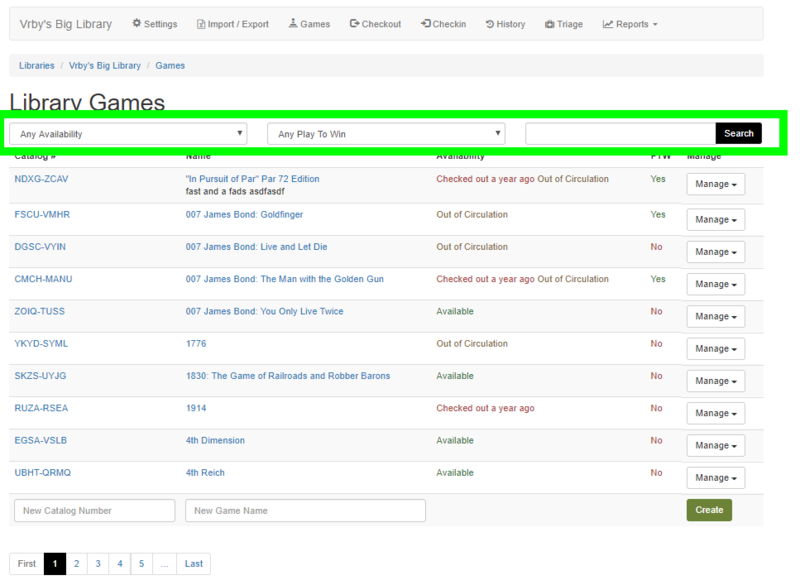 Here, you'll see a listing of the existing game libraries in our system. At the bottom, you'll see the option to create a new library. To create a game library, you can enter the name and home city. When you enter the city and state, the system will offer geolocation suggestions; just click on the one that matches. Then click on Create. 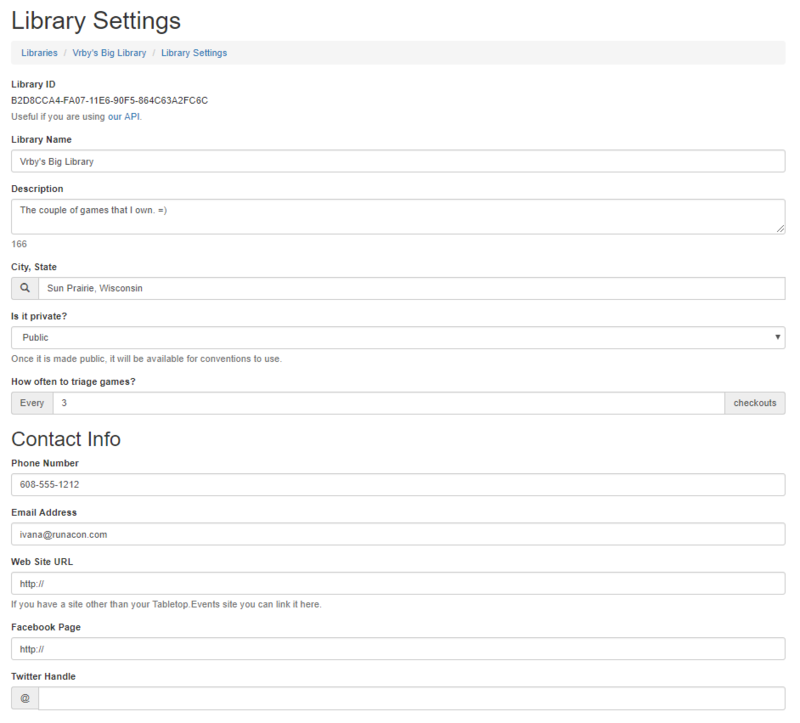 Now you'll be taken to the library settings page, where you will see your library ID (useful for if you are using our API). You can enter the description for your library, and determine whether it should be private (for your use only), or if it should be public and available for conventions to use. You can also determine how often you wish to triage games (ie, check for damage or lost parts, etc.). You'll enter the number of checkouts after which the game should be triaged. Under Privileges, you can give privileges to other users that you want to have access to your library. These users will need to have a Tabletop Events account already. You can enter their name or e-mail address, and our system will provide a listing of possible matches. When you have found the correct user, you can click on Choose. 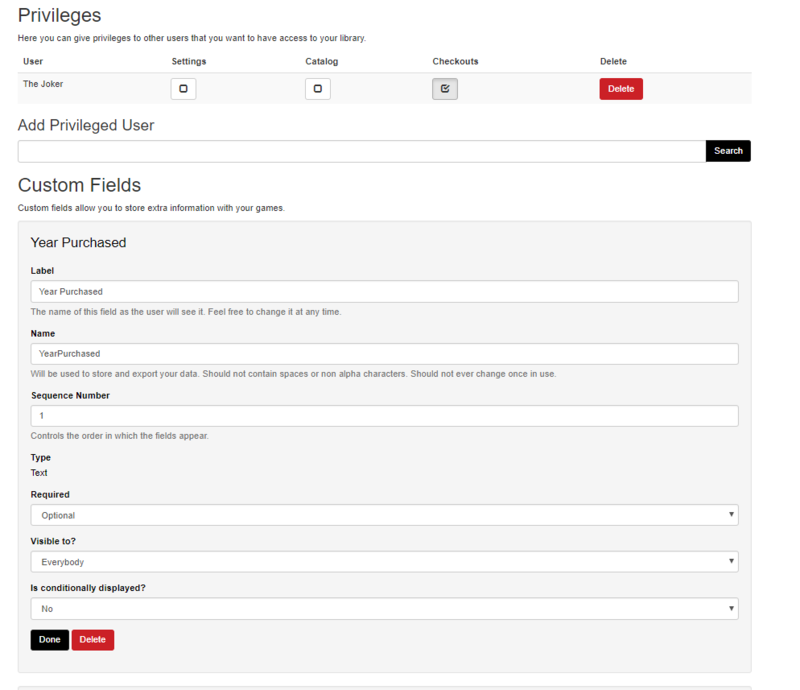 Once you've chosen the user, you can select the privileges you wish for them to have (access to settings, catalogs, and/or checkouts). The check mark in the box means the user has that privilege. At the bottom of the screen, you can add custom fields. This would allow you to store additional information with your games. For example, you may include information about where the game was received from, and a custom field will allow you to enter that here. Enter the label information for the field, and select the type of field from the drop-down list. Then, click on Create. This will display additional settings for that custom field. You will determine the order in which the custom fields will appear, whether they are required or optional and whether they are visible everyone or just the library owner. You can also determine whether a field is conditionally displayed. If you select “Yes”, then you will be able to select the conditional field and enter the conditional value which will determine if this field will be displayed. On the Library Import/Export page, you can import your library information from a CSV file. We offer a sample CSV file which shows the information that you'll need to include for your library. 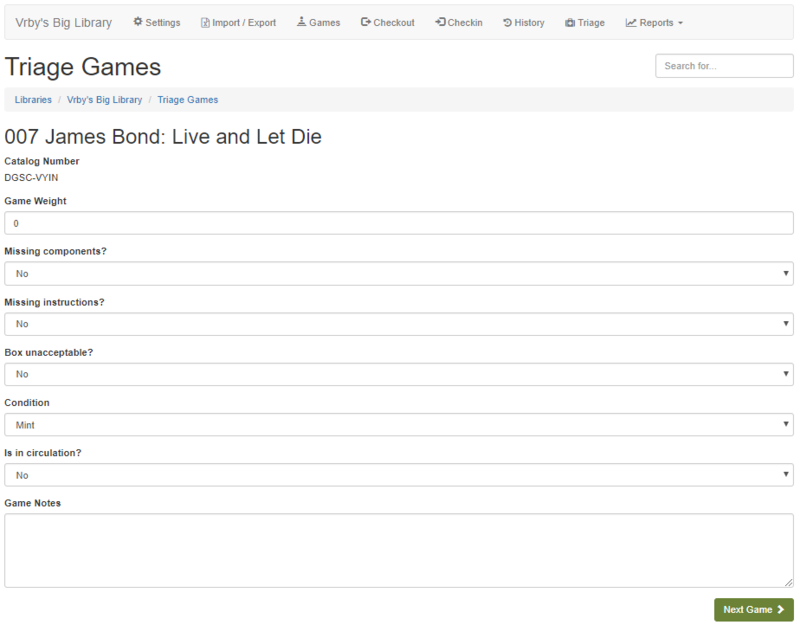 You can also import a game collection from a Board Game Geek user account. Just enter the BGG username, and click on Import from BGG. You'll also have the option to export your data as a CSV, in case you ever wish to manage your library outside of Tabletop Events. All you need to do is click on Export Games as CSV. 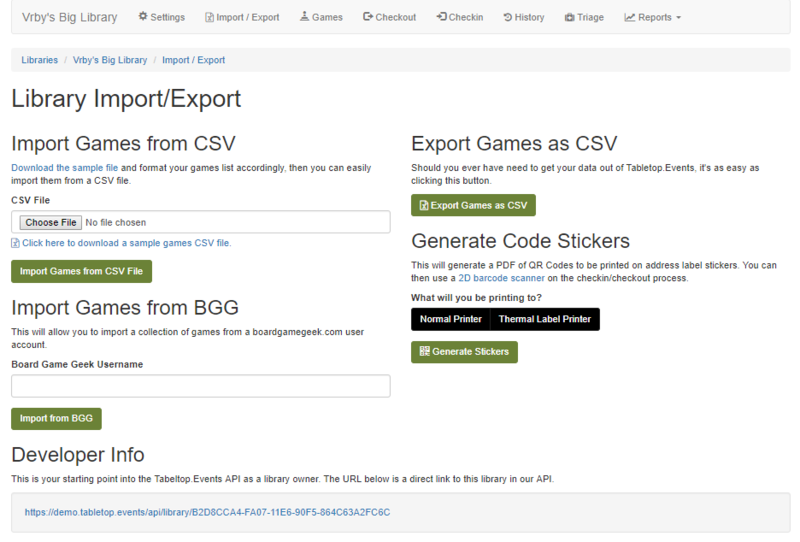 On the Library Import/Export page, you can generate code stickers that will allow you to scan games as they are checked in and out of your game library. These can be printed on either a normal printer or a thermal label printer. If you select Normal Printer, you will see the option to print the stickers for the 30, 60, 90, or 120 most recent games, or all games. If you select Thermal Label Printer, you can specify the exact number of most recent games for which you wish to print stickers. When you have determined the number of stickers you wish to print, click on Generate Stickers, and a PDF file called stickers.pdf will be generated and downloaded automatically. At the bottom of the page, you'll see developer info. This will be useful if you are a developer using our API to manage your library. On the Library Games page, you'll be able to search for games that are currently in the library, and add new games to the library individually. In the field at the top left, you can search for games based on their current availability status. In the field at the top center, you can search for games based on whether they are play to win games or not. To the right of each game, you can click on Manage to view, edit, or delete the game. When you click on View, you'll see the details about the game (including player count, times checked out, etc.) and the game's current availability status. You can also view the game's checkout history, edit or delete the game, or generate a new sticker for the game. When you click on Edit, you'll be able to edit any of the game's details and add notes about the game.You can enter details about the game such as a description, player count, play time, etc. You can also include a game weight (which can be useful in determining whether any parts are missing), indicate if there are missing components or instructions or issues with the box, note the condition, remove the game from circulation, and add notes about the game. At the bottom of the Library Games screen, you can enter a new catalog number and the name of a game to add the game to the library. 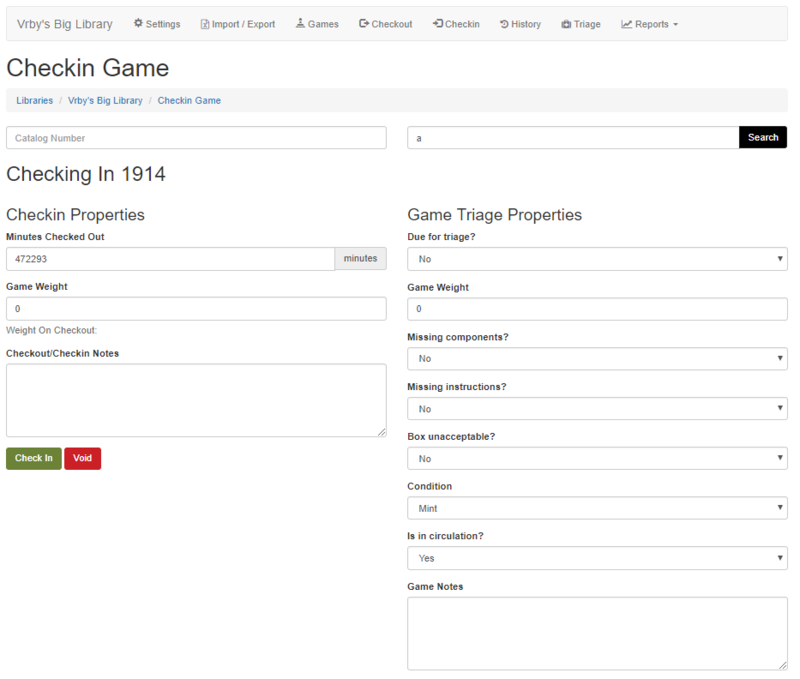 When you add a game to the library, the game will be assigned a unique game ID in our system. You can also use your own catalog number for the game. 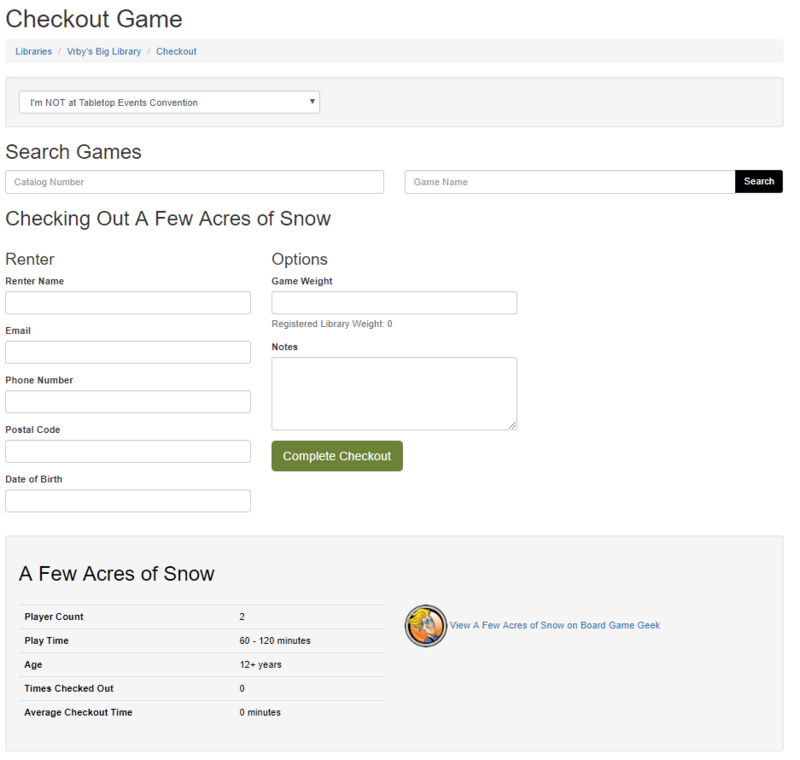 In the Checkout Game screen, you will first want to select whether you are at a Tabletop.Events convention or not. If you are at a Tabletop.Events convention, you'll then see a drop-down list of the conventions that are using this game library, and can select your current convention. Next, you can search for a game by its catalog number or name. (If the game has a sticker, you can also scan the sticker.) The system will provide a listing of all possible matches in this library. When you find the correct game, you can click on Choose. Once you've selected the game, you will be able to enter information about the person checking out the game. If you are at a Tabletop.Events convention, you'll have the option to enter the person's badge number, and then the information will be auto-filled. If you are not at a Tabletop.Events convention, then you can enter the renter information. 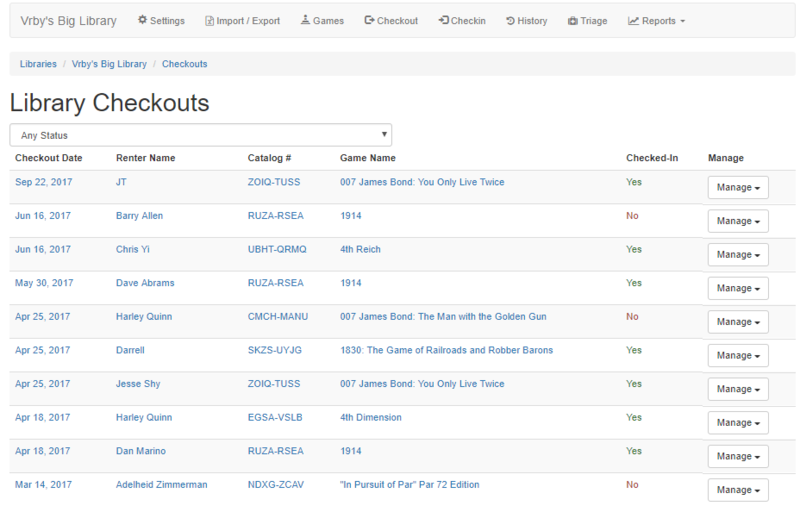 You also have the option to enter a game weight at the time of checkout, and any notes that you wish to include. When you are finished, you can click on Complete Checkout. You will then be returned to a fresh Checkout Game screen. On the left side of the screen, you will see the Checkin Properties section. At the top, you'll see a field that shows how many minutes the game was checked out for. You can also enter the game's weight upon checkin, and any notes. On the right side of the screen, you can edit the game's triage properties. This will allow you to indicate whether the game is due for triage, missing components or instructions, or if it has any box or condition issues. You can also remove the game from circulation and make additional notes about the game. When you are finished, you can click on Check In. Note: The Void button on this screen voids the current checkout for this game. This should be used only if a game was checked out accidentally. On the History page, you can see the complete history of all of the game checkouts. You can click on the date or renter name to see information about that checkout. You can click on the catalog number or game name for information about and the checkout history for that game. On the right side of the screen, you can click to view or manage the checkout. 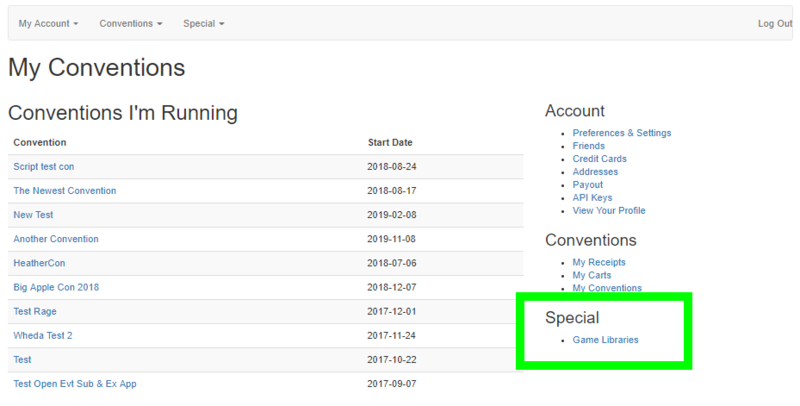 On the Triage Games page, you'll be able to edit the information for any games that are due for triage (as determined by their triage settings). Here, you can enter the current game weight, determine whether the game is missing parts or instructions, indicate if the box is acceptable and if the condition has changed, remove the game from circulation, or add notes about the game. When you are finished triaging the game, you can click on the Next Game button to move on to the next game that is due for triage. Under Reports, you have the option of the Checkout Overview report or the Usage report. Click on the report you wish to run. Next, select the start and end dates for the report. Then, you can generate the report to view it, or export it as a CSV file. The Checkout Overview will show the number of checkouts and the total checkout hours during the time frame you have specified. The Usage report will show which games were checked out, by whom, on which dates, and for how long during the time frame you have specified.